A change to the exchange rate of a pegged currency. For example, if the central bank has declared a currency to be worth 10 U.S. dollars and later changes the exchange rate to $8, one refers to this as a revaluation. A revaluation generally, but does not always, refer to an increase in value. the increase in the valuation of a FIXED ASSET to its current market value. Revaluation of fixed assets such as land and buildings may be necessary to reflect their APPRECIATION as property prices rise. Where revaluation takes place, the increase in the value of the fixed asset over its NET BOOK VALUE is added to the company's RESERVES. an administered increase in the EXCHANGE RATE of a currency against other currencies under a FIXED EXCHANGE RATE SYSTEM; for example, an increase in the value of the UK pound (£) against the US dollar ($) from one fixed or ‘pegged’ level to a higher level, say, from £1 = $2 to £1 = $3. Governments resort to revaluations as a means of eliminating a BALANCE OF PAYMENTS surplus. 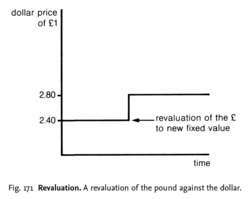 The effect of a revaluation is to make imports (in the local currency) cheaper, thereby inducing an increase in import demand, and exports (in the local currency) more expensive, thereby reducing export demand. Contrast DEVALUATION. Fig. 171 Revaluation. A revaluation of the pound against the dollar. an administered increase in the value of one CURRENCY against other currencies under a FIXED EXCHANGE-RATE SYSTEM, for example, as in Fig. 171, an increase in the value of the UK pound against the US dollar from one fixed value to another higher value, say, from £1 = $2.40 to £1 = $2.80. The objectives of a revaluation are to assist in the removal of a surplus in a country's BALANCE OF PAYMENTS and the excessive accumulation of INTERNATIONAL RESERVES. A revaluation makes IMPORTS (in the local currency) cheaper and EXPORTS (in the local currency) more expensive, thereby encouraging additional imports and lowering export demand. How successful a revaluation is in removing a payments surplus depends on the reactions of export and import volumes to the change in relative prices, that is, the PRICE-ELASTICITY OF DEMAND for exports and imports. If these values are low, that is, demand is inelastic, trade volumes will not change very much, and the revaluation may in fact make the surplus larger. On the other hand, if export and import demand is elastic, then the change in trade volumes will operate to remove the surplus. BALANCE-OF-PAYMENTS EQUILIBRIUM will be restored if the sum of export and import elasticities is greater than unity (the MARSHALL-LERNER CONDITION). Also, whether or not a revaluation ‘works’ in restoring balance-of-payments equilibrium depends on a number of factors, including the reaction of domestic firms and the effect of the government's other policies over the longer term (for example, the control of inflation). For business, a revaluation makes imports more price-competitive, putting pressure on domestic producers either to cut their prices or, alternatively, depend more on advertising and sales promotion. Likewise, in export markets, a firm may choose to hold its prices, accepting lower profit margins rather than increase them in order to maintain market share. Thus, in the short run, revaluations threaten firms’ current profitability and market position, putting firms under pressure to cut costs by improving productivity and generally placing a greater emphasis on PRODUCT DIFFERENTIATION as a means of remaining competitive against overseas suppliers. Contrast DEVALUATION. Proposals for more regular revaluations are important to ensure a closer relationship between the market and rates. The burning question; Q Is the Barclay Review on Business Rates a positive outcome for Scottish businesses? From now on, Mavrou said, general property revaluations will take place every three years. In addition to the revaluation, the universal business rate (UBR) multiplier has been increased from 0. In the context of tiered partnerships, requiring a lower-tier partnership to revalue its assets if an upper-tier partnership that holds a controlling interest (representing more than 50% of capital or profits) in the lower-tier partnership revalues its assets in connection with a revaluation event. Llandudno, Rhyl and Wrexham were in that list of UK towns that would benefit from the revaluation. Bilnger GVA forecasts that the 2017 revaluation uniform business rate will rise to 51. Businesses still have time to make a case for lower rates and he urged owners to check their revaluations before the April 1 deadline. Under IFRS, International Accounting Standard (IAS) 16 allows companies to choose either the cost model or the revaluation model when accounting for property, plant and equipment (PPE). The inventor of the New Revaluation Arrow now seeks a third party licensee to manufacture, market, and distribute the product for him under a royalty agreement. This is even if accumulation of foreign currency and foreign assets are not as active as before, as what happened in 2013 because of negative revaluation, mainly the decreased valuation of gold. National portfolio manager Ben Wall said: "It is difficult to understand the logic behind the decision to delay the rating revaluation as it will impact many retailers who are already struggling and facing financial hardship. A Midland based budget retailer with more than 300 shops around the UK has weighed into the business rating revaluation row.